Tundra mains are 18" diameter Carlisle Turf Glide C4X 8.00-6 (4-ply with tube) mounted on Quad City 6" aluminum rims with new third generation brakes. 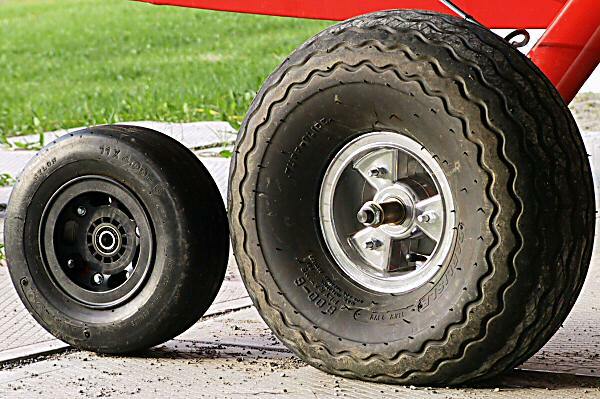 The wheel on the left is the standard sold with Challengers in the United States for both nose and mains - 11x4.00-5 tires on lightweight plastic 5" rims. In Canada since the fall of 2005 the mains are 13x5.00-6 on 6" aluminum rims. Copyright Bryan Quickmire / National Ultralight Inc. All rights reserved.